I recently started doing more clothing box reviews, and I realized I need shoes to go along with them, so I decided to try the Just Fab first month offer of 2 pairs of shoes for $39.95. If you aren’t familiar, JustFab is a monthly clothing, shoes and accessories subscription. You can shop their merchandise like normal retail, but they have a VIP subscription that gives you better prices on everything in their store. On the first of every month, they release new styles and you can pick any item you want – either from your personal ‘Boutique’ or across the site. You can also skip the month. However, if you don’t pick or skip by the 5th of each month, you get charged $39.95 store credit to spend any time. P.S. – I have tips on how to make the most of this subscription pricing at the end of the review. This model is similar to how ShoeDazzle, Fabletics, and AdoreMe work. You pick exactly what items you want – no surprises. The Cost: $39.95 a month (but you can skip a month by the 5th each month). Check out all of our Just Fab Reviews! These shoes have a suede-like synthetic upper fabric. The blush color is gorgeous and on trend. And these shoes have the most important feature to me in a heeled shoe: an ankle strap! These were super comfortable to walk in, and the style of the shoe seems timeless to me. I’ll definitely wear these a lot. Verdict: Do I think these shoes are worth the $39.95 value each? Yep, I’m happy with the quality for that price point. BUT! You never actually need to pay that pricing for Just Fab. Step 1: Sign up for their new customer discount offer. It’s typically 2 pairs of shoes for $39.95 with free shipping. You can check what their latest offer is here. If you are paying around $20 or less per pair of shoes, it’s a great deal. Extra Savings Tip: When the offer is 2 pairs of shoes for $39.95, that discount applies if you add more to your cart, too. 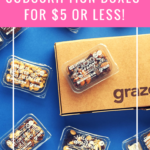 At this point, you can completely cancel your subscription if you never want to be charged by JustFab again, but if you follow the next step, it’s totally worth keeping your subscription for additional deals. Step 2: Set a JustFab reminder alarm on your phone/computer on the 1st of every month. On the 1st, go into your JustFab account and skip that month. By doing this every month, JustFab will never charge you the $39.95 monthly fee. It’s super easy to do, the main thing is remembering to do it! If you don’t skip by the 5th, you’ll be charged $39.95, and you’ll get a $39.95 credit to spend on any item on the site. This isn’t the worst thing in the world, but to get the biggest value out of JustFab, you don’t want that to happen. Why don’t want to end up with JustFab credits even though you still want to shop JustFab? You can’t apply credits to any of the deals they offer. And they offer deep discount deals every month! And since I already paid full price for that credit, I’m truly paying $79.90 for these two pairs of shoes instead of $47.97. By using the discounts and avoiding any credit in my account that I would have to redeem on regular prices, I’m saving $31.93 on this order alone. Can you still get these shoes if you sign up today? Yep! As of publication, both were still in stock. What do you think of JustFab? That is exactly how I use Just fab. They also have points that you accumulate even on sale items. And overall I find the clothes good quality and wash well. I skip every month and take advantage of the sales. And the reviews are really helpful to get an idea of the sizes and how an item actually fits. I like the sales for their jewelry too and have been known to stock up on earrings. I don’t do much with their shoes because they aren’t super comfy. I’m on my feet too much to wear stuff with no support or cushion, but I do have a cute pair of Ked-style floral sneakers from them that are simply adorable. I need both of those dresses! I love that teal dress! Where is it from? It’s from an upcoming Gwynnie Bee review! (The brand is eShakti) Hope that helps! I mentioned Eshakti recently they customize the items you order from them and have a 25$ coupon when you sign up for emails. It takes a couple of weeks but they’ll make a dress,pants, shirts or skirts for your height. It’s truly awesome. Just thought you might want to check them out. Ooo thank you for the heads up! After getting to wear their dresses I’m a fan now! Thanks for the coupon hacks- that’s exactly what I find helpful ! "I skipped April and May but based on these spoilers so far, June is a GO!"